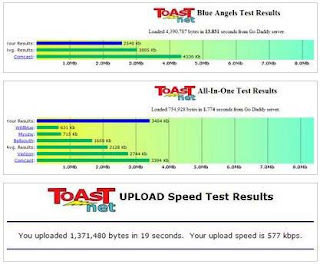 AJ and I performed upload and download speed tests at toast.net before our service was switched. As I mentioned in an earlier post, upload speeds are typically much slower than the download. 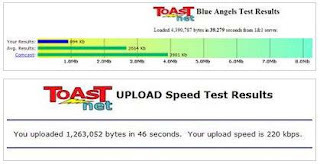 Our upload speed is almost three times as fast. Our download speed (wow, pages load sooooo fast now!) is four times faster. It cost $65 today. It takes 2 weeks to get the phone transferred over, and once that happens I can cancel the land line. I’ve already emailed the slower provider and asked them to downgrade our account from Tier II ($69.95/month) to Tier I ($49.95/month). I will cancel the old ISP by the end of the month. That gives me just over three weeks to switch my email addresses to something else. I already use gmail for this blog, but I had to get a new gmail account for personal use as this new company does not provide email. I will begin snowflaking this savings as soon as it is possible. Mr. A’s having another little lull, but there is some work on the horizon. I’m very pleased that we are going to be able to lower the cost of our phone and internet. I received a letter in the mail a few days ago that our electricity provider is going to switch to one that is local. Oh, I sure do hope that they cost us less. That would be so fantastic. When our power goes out, it takes longer for it to come back on, because the two companies have to come to an agreement on whose lines are having the problem, before they can begin making repairs. That can sometimes take longer than the repair itself. This is just so exciting! Faster internet for a lot less!! Wow! 3 comments to High Speed Internet ! !